Over the past two years we have heard the media and many crazies on the left calling President Trump many things. We have heard things like he is unhinged, mentally ill, mentally incompetent, deranged, mentally unfit, mentally unstable, personality disorder and a clear and present danger to the U.S.A and on and on. I am not a presidential historian but I do know this, President Trump is the greatest president in my life time. His accomplishments are. · Almost 4 million jobs created since election. · More Americans are now employed than ever recorded before in our history. · We have created more than 400,000 manufacturing jobs since my election. · Manufacturing jobs growing at the fastest rate in more than THREE DECADES. · Economic growth last quarter hit 4.2 percent. · New unemployment claims recently hit a 49-year low. · Median household income has hit highest level ever recorded. · African-American unemployment has recently achieved the lowest rate ever recorded. · Hispanic-American unemployment is at the lowest rate ever recorded. · Asian-American unemployment recently achieved the lowest rate ever recorded. · Women’s unemployment recently reached the lowest rate in 65 years. · Youth unemployment has recently hit the lowest rate in nearly half a century. · Lowest unemployment rate ever recorded for Americans without a high school diploma. · Under my Administration, veterans’ unemployment recently reached its lowest rate in nearly 20 years. · Almost 3.9 million Americans have been lifted off food stamps since the election. · The Pledge to America’s Workers has resulted in employers committing to train more than 4 million Americans. We are committed to VOCATIONAL education. · 95 percent of U.S. manufacturers are optimistic about the future—the highest ever. · Retail sales surged last month, up another 6 percent over last year. · Signed the biggest package of tax cuts and reforms in history. After tax cuts, over $300 billion poured back in to the U.S. in the first quarter alone. · As a result of our tax bill, small businesses will have the lowest top marginal tax rate in more than 80 years. · Helped win U.S. bid for the 2028 Summer Olympics in Los Angeles. · Helped win U.S.-Mexico-Canada’s united bid for 2026 World Cup. · Opened ANWR and approved Keystone XL and Dakota Access Pipelines. · Record number of regulations eliminated. · Enacted regulatory relief for community banks and credit unions. · Obamacare individual mandate penalty GONE. · My Administration is providing more affordable healthcare options for Americans through association health plans and short-term duration plans. · Last month, the FDA approved more affordable generic drugs than ever before in history. And thanks to our efforts, many drug companies are freezing or reversing planned price increases. · We reformed the Medicare program to stop hospitals from overcharging low-income seniors on their drugs—saving seniors hundreds of millions of dollars this year alone. · Secured $6 billion in NEW funding to fight the opioid epidemic. · We have reduced high-dose opioid prescriptions by 16 percent during my first year in office. · Signed VA Choice Act and VA Accountability Act, expanded VA telehealth services, walk-in-clinics, and same-day urgent primary and mental health care. · Increased our coal exports by 60 percent; U.S. oil production recently reached all-time high. · United States is a net natural gas exporter for the first time since 1957. · Withdrew the United States from the job-killing Paris Climate Accord. · Cancelled the illegal, anti-coal, so-called Clean Power Plan. · Secured record $700 billion in military funding; $716 billion next year. · NATO allies are spending $69 billion more on defense since 2016. · Process has begun to make the Space Force the 6th branch of the Armed Forces. · Confirmed more circuit court judges than any other new administration. · Confirmed Supreme Court Justice Neil Gorsuch and nominated Judge Brett Kavanaugh. 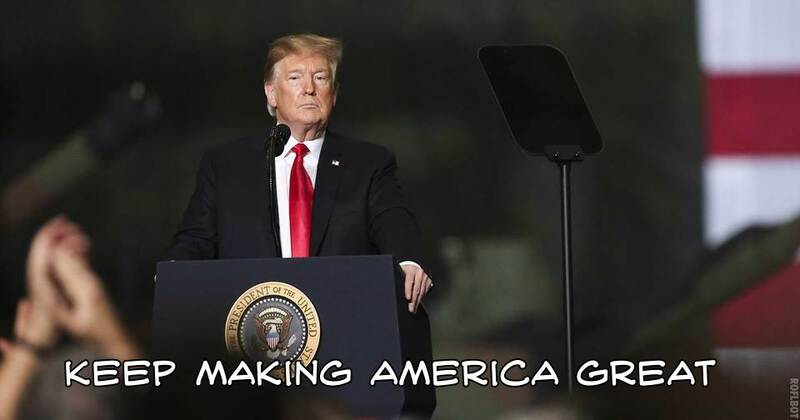 · Withdrew from the horrible, one-sided Iran Deal. · Moved U.S. Embassy to Jerusalem. · Protecting Americans from terrorists with the Travel Ban, upheld by Supreme Court. · Issued Executive Order to keep open Guantanamo Bay. · Concluded a historic U.S.-Mexico Trade Deal to replace NAFTA. And negotiations with Canada are underway as we speak. · Reached a breakthrough agreement with the E.U. to increase U.S. exports. · Imposed tariffs on foreign steel and aluminum to protect our national security. 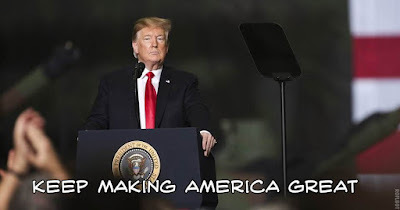 · Imposed tariffs on China in response to China’s forced technology transfer, intellectual property theft, and their chronically abusive trade practices. · Net exports are on track to increase by $59 billion this year. · Improved vetting and screening for refugees, and switched focus to overseas resettlement. If that’s mentally ill I’ll take it any day of the week. Now we have the new media darling of the Left Beto O’Rourke. So Trump is crazy and O’Rourke is not?